Geography and International Studies Professor Ilaria Giglioli looks on as her teammate explains the results of a team exercise. New College students got a glimpse into the complex reasons why people migrate from their home countries during a recent workshop called University Without Walls. 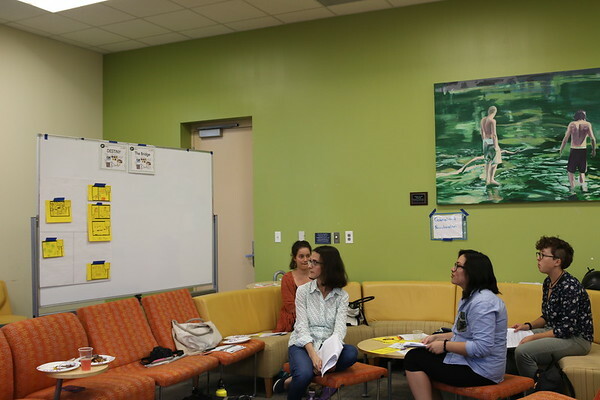 Facilitators from the Florida Immigrant Coalition gave attendees a transnational passport filled with activities to complete throughout the program. The first activity was talking with other participants about their origin stories. “My mother came to the United States fleeing domestic violence,” said one participant. “We left our home and the rest of our family behind.” Another said she and her family were fleeing civil war when they left their home country. Next, students placed colored stickers on a world map showing from where their own families migrated. Each color represented a different root cause of migration: politics, family, domestic or state violence, global warming, or economics. Students also organized into groups to study the root causes of migration throughout different historical periods. The coalition supplied packets with information about causes of mass migration throughout world history. Military conflict, for instance, often results in refugee crises for neighboring countries due to the large number of civilians fleeing the war zone. Each group drew a comic strip showing how different factors impacted migration during the time period in its packet. Assistant Professor of Geography and International Studies Ilaria Giglioli organized the event, which is a follow up to an independent study project she led during the January Interterm. Giglioli’s research has focused on the Tunisian-Italian border, but she’d like to work on a project “that’s more locally embedded.” She hopes to forge a collaborative relationship between New College and Florida Immigrant Coalition that will give students more opportunities to learn about migration.